If you need a place to store your RV and want something with all the extras, consider this RV garage plan. Begin with the handsome exterior dressed up with stonework, siding and stylish garage doors. The RV bay offers convenience with its 16’ ceiling and drive-thru feature making it easy to pull thru the garage instead of facing the hassle of backing your motor home out of the garage. While you are on the road in your RV, safely store the family cars in the oversized two-car garage area. Special features include a 10’ ceiling and extra deep bays which easily handle a boat id desired. Practical extras include a full bath and laundry area making clean-ups a snap. Upstairs, an unfinished loft provides plenty of room for storage. 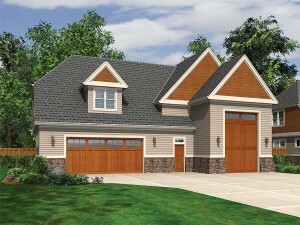 Carefully designed to accommodate many needs, this 2-car garage plan with RV storage and loft is a valuable addition to any piece of property. For more designs like this one, view this collection of RV garage plans.